The New York Times is reporting that US Special Forces are said to have been involved today in two raids in Africa, one in Somalia and the other in Libya. Special Forces in Libya are said to have captured Nazih Abdul-Hamed al-Ruqai and known as Abu Anas al-Liby. The al Qaeda leader was wanted for his role in the deadly 1998 bombings of two U.S. embassies in Africa. In the second raid, US Navy Seals in Somalia targeted a senior leader of the Shabab, the Somali terrorist group who has planned the terror attack a little over a week ago at a Nairobi shopping mall that killed more than 60 people. American commandos carried out raids on Saturday in two far-flung African countries in a powerful flex of military muscle aimed at capturing fugitive terrorist suspects. American troops assisted by F.B.I. and C.I.A. agents seized a suspected leader of Al Qaeda on the streets of Tripoli, Libya, while Navy SEALs raided the seaside villa of a militant leader in a predawn firefight on the coast of Somalia. UPDATE I: As reported at Legal Insurrection, there there is conflicting news regarding the raids, news outlets are confirming that an Al Shabaab leader was a target of the raid, reports about whether or not that target was captured or killed are conflicting. UPDATE II: CBS News – Embassy bombings figure nabbed by Delta Force in Libya. U.S. special forces on Saturday carried out a raid in the Libyan capital to capture an al-Qaeda leader linked to the 1998 American Embassy bombings in East Africa and wanted by the United States for more than a decade, U.S. officials said. The news of the capture was previously confirmed by CBS News. Last week it was reported that four Americans were murdered aboard the hijacked ’Quest” off the coast of Oman at the hands of Somali pirates. Now it is being reported from the UK Daily Mail that the murder of four Americans, Jean and Scott Adam, from California, and Phyllis Macay and Robert Riggle, at the hands of Somali pirates could have been prevented. If this is the case, this hijacking and eventual murder of the four Americans is even more tragic than originally reported. The killing of four American hostages on board their yacht may have been sparked by the U.S. Navy’s decision to detain two of the pirates who had come to negotiate with them, it emerged today. Jean and Scott Adam, from California, and Phyllis Macay and Robert Riggle, from Seattle, were shot aboard the Quest off the coast of Oman, East Africa, on Tuesday. A day earlier, two Somali pirates had boarded the U.S.S. Sterett stationed 600 yards away from the yacht to talk face-to-face, and American officials thought a breakthrough with the gang was imminent. According to reports, the FBI negotiators did not take the leaders of Somali pirates that they were negotiating with seriously. The Somali leaders had left orders if they did not return, the hostages should be killed. Sadly, that is was happened. A pirate source quoted by the newspaper said their leader had told them that if he did not return, they should kill the hostages. American officials say they do not know that to be the case. Sad ending to hijacked yacht by Somali pirates … all four Americans dead. The news broke early this morning on Fox News. As reported last week, the Quest was hijacked by Somali pirates south of Oman with four Americans aboard. The Navy had been following the yacht since it had been boarded by pirates. As stated at Hot Air, the Navy had been negotiating with the pirates when the Somalis launched a rocket at the American ship, and gunfire erupted leaving the hostages mortally wounded. The news broke today that the 4 American hostages, Jean and Scott Adam, Phyllis Macay and Bob Riggle were all killed. The pirates claim that they killed the hostages after the US Navy fired on them. Because Somali pirates are known through out the world for their truth telling. Like that is supposed to be some kind of a justification to murder innocent civilians. Maybe the following needs to be done the next time any of these pirates are seen any where in the water. It might just be the solution to the never ending problem. One has to wonder what will ever put an end to this nonsense. Christan yachters handing out Bibles murdered by Somali savages. The Astute Blogger has the right idea and is correct, had this been met with force at the outset, these sea terrorists would never have ever shown their faces again. Remember when the United States never tolerated any of their citizens to be murdered? Its happened again … Somali pirates have hijacked a yacht with four Americans and bibles aboard. 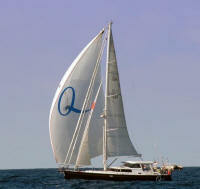 The Quest, owned by Jean and Scott Adam (website), a couple from California who has been sailing around the world since December 2004. The Quest is a Davidson 58 Pilot House Sloop. Their 2011 travel plans have appeared to have met with a sudden unexpected hijacking. An American couple that has sailed the world with a yacht full of Bibles was hijacked by Somali pirates, and the U.S. said Saturday it is assessing possible options. We wish the the Adams the best of luck in getting out of this one. A lot of praying and using the Bibles on board might be the best option. Of course it might be a thought for those tacthing to avoid Somali waters. This hijacking comes on the foot heal of a Somali pirate was sentenced to 33 years in prison by a New York court for the 2009 hijacking of the Maersk Alabama. UPDATE II: 2/22/11 - Oh dear God, Fox News this morning reported that the 4 Americans captured by pirates are dead. Further details were that the 4 captured Amercans and 2 pirates were killed. Terrible, just terrible.